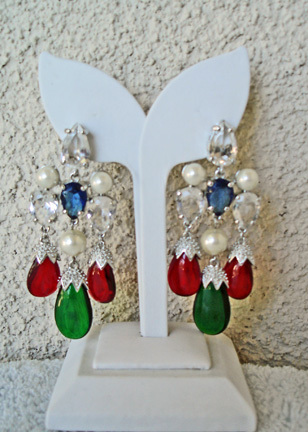 SCAASI simulated gemstone and clear stone oversized chandelier earrings fashioned in rhodium plated polished silvertone. The earrings showcase a prong-set, faceted, pear-cut glass stone that supports its tiered drop. 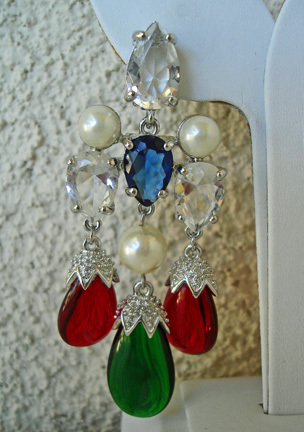 Multi-sized round, white simulated pearls and prong-set, faceted, pear-cut, clear and blue glass stones create a cluster on the drop. Dangles have bead cap details For movement, smooth pear-cut simulated ruby and simulated emerald stones dangle from the design. Clip on backs; Measures 3"L x 1 1/4"W. In box.